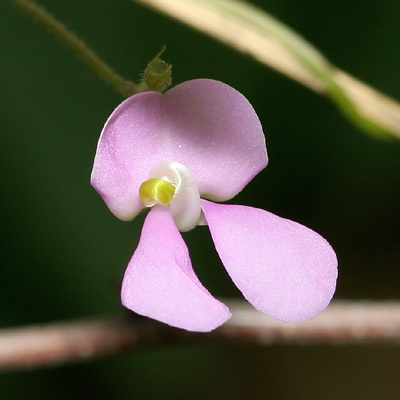 Description: The flowers are in racemes that emerge from the leaf axils. The individual flowers have a broad, upright, fan-shaped banner petal and a tightly coiled, white and green keel above 2 large, paddle-shaped wing petals. 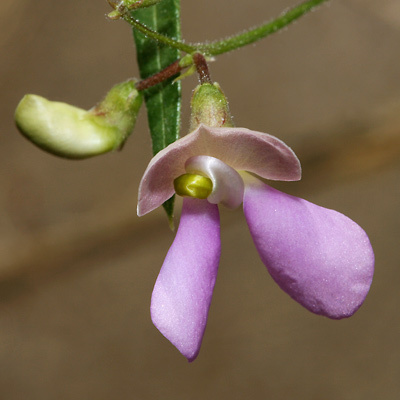 The flowers are followed by elongated, flattened, slightly curved, hairy, green drying to brown, up to 2 3/4 inch (7 cm) long bean pods. The seeds are solid or speckled dark red-brown and have a white hilum (attachment scar). The leaves have slender, tapering, point-tipped stipules and are green, sparsely hairy, alternate, and trifoliate with 3 linear to narrowly lance-shaped, tapering, point-tipped leaflets. The side leaflets are sometimes slightly subhastately lobed on only one side, giving them a lopsided appearance. 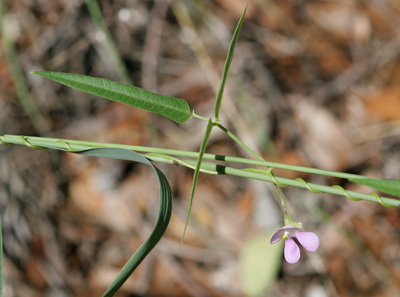 The stems are long, slender, twining or trailing, green, and lightly hairy. 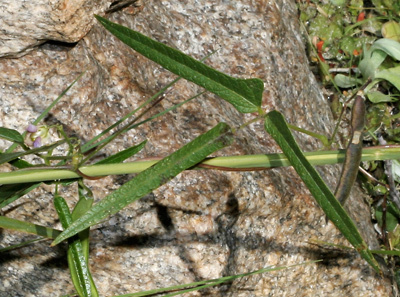 The plants are sparse and slender. This variety of Phaseolus acutifolius is the most common wild type here and can be distinguished by its very narrow leaflets. Phaseolus acutifolius has long been cultivated as a food plant, but the domesticated types are more productive and have broad leaflets, beans of various colors, and a broader, much more robust growth habit. 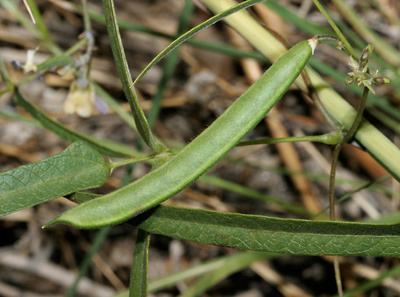 The similar Slimleaf Bean (Phaseolus angustissimus) has leaflets with blunted tips and often a pair of subhastate basal lobes, while Pinos Altos Mountain Bean (Phaseolus parvulus) grows in the mountains and has a bit broader, somewhat sickle-shaped leaflets. Edible – Although relatively small, the dried beans are edible.